Awww Susan.. I just tagged you! Never made Avgolemono, though I can't think why. With a jar of grape leaves in the pantry staring at me every time I open the damn door, these are on the weekend menu. Thanks. what an elaborate step-by-step explanation. wonderful post, susan. we're alike in our love for itsy bitsy tapas-like thingies. Love the interesting things you have in your filling, especially the apricots. I'd love this! Also, it's amazing that I don't have even one of those cookbooks, since I have so many. All the books you talked about sound great! It looks so delicious, and that sauce is totally new to me. these look beautiful! I'm inspired! Susan - I'm with Patricia on the filling. It would be GONE before I finished making these! I, too, love little bits and bites, and dolmas are a favorite. Don't think I've had these. The pic of the rice is beautiful. Pine nuts cost a bomb here! Vine leaves as they call it here is a speciality in Arabic cuisine. I suppose you have to acquire a taste for it, I didn't quite like what I had here. Your step by step recipe makes me reconsider trying this out..! I love that rice filling - how tempting!! So sorry that I couldn't thank you earlier. I did see your comment on the corriander seeds but had very little internet time, so couldn't come around to thank you. You know what, I think my seeds are old....maybe I should get a fresh batch and try them. Some interesting books there; I've made a note. What do grape leaves taste like? I have never tasted the grape leaves before! your rice filling looks delicious! Thank you, Shn! We have Greek fests here, too, but we always seem to miss them. Brined leaves are an acquired taste, but soaking them prior to rolling does take the edge off the salt. Suganya – Not to worry. What goes around, comes around – again, and again, and again! Thanks, Bee. When I step back and look at this, it is rather elaborate, but I’ve made them so often, it is second nature. Three cheers for tapas thingies! Lydia – No obligation, no rush. We’re all juggling many balls. 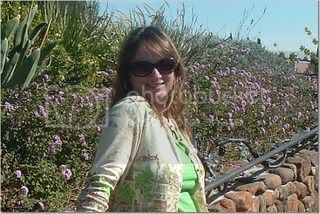 You are an ideal blogger to tag for cookbooks. Thanks, Kalyn. There are as many variations for stuffed grape leaves as regions and imagination allow….so many cookbooks, too! Hi, Patricia. The filling is rather good on its own. Thanks. The sauce doesn’t taste eggy at all, but creamy with a sharp lemon tang. It is very flavorful without the extra fat of a real cream or butter sauce. Thanks, Meghan. Nothing to be anxious about. While some are damaged from being forced into the jar (and sometimes in removing them), they are quite tough on the teeth if not cooked enough. They roll very easily. Hope you try them. The recipe has a lot of steps, but these are special cautions I’ve added for those who haven’t made them yet. Hi, Toni. The filling has the best chance if you’ve already eaten and are preparing this for later in day. They are even better next day, after a good chill in the fridge. Thank you, Sra. Pine nuts aren’t cheap here, either; a small jar for $3USD. Occasionally I will find a “sale,” but I’ve never seen them in bulk economy size. 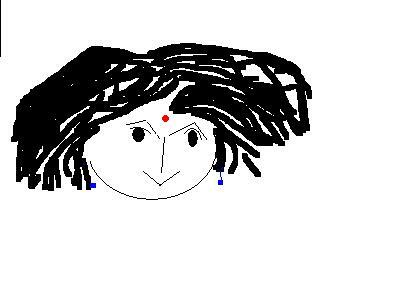 Hi, Jyothsna. Yes, these are a typical Arabic appetizer, but there are many different recipes. It may be that the brine was not to your liking, or you didn’t care for the particular filling. I personally find too much salt repellent. Very happy to have helped, Sandeepa. Your odds of success should improve w/ fresh seeds. I have been hanging out in the Mediterranean a while, but now that you mention it, it’s time for me to go traveling again. At some point, I will be posting Indian recipes, too, but my results have not yet been good enough to inspire enough confidence to present to the community. I am undaunted, but do need more practice. Hi, Cynthia. Hmmm. 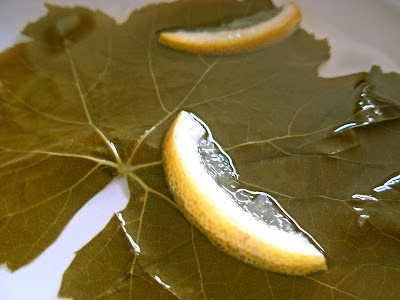 Very roughly, grape leaves taste salty and snappy, the same general unique flavor as a pickled caper, but can be modified by a good soaking to leach out some of the salt. Thank you, Nanditha. 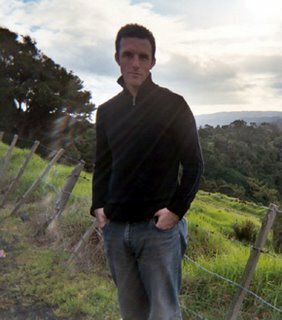 I do enjoy my cookbooks, but there is an even wider world of recipes in the blogging community. Sometimes I am overwhelmed (yet thrilled) by all the choices. I find bloggers’ recipes generally more reliable than cookbooks and magazines. I try to select my cookbooks carefully. Susan, lovie - Your tag has been duly noted, and I will make the Meme my next post. I will, first, have to peruse all of the cookery books I have with me in the US (that alone will help in selecting only 7). I may just end up closing my eyes and pointing to 7 books. Of course your list is inspirational in that it is varied, with both seemingly erudite and approachable texts. Thank you for the tips on how to carefully unwrap, separate and desalinate the grape leaves, for I have wonderered about this when staring at jars of grape leaves in my favorite Middle-Eastern grocery store in Long Beach. 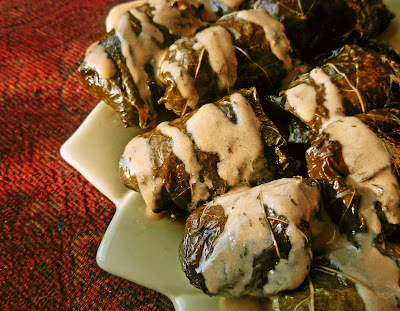 Love dolmas; haven't made them in several years now, but your post brought back memories. I've never eaten them with avgolemono, just ate them with the braising-liquid of olive oil and lemon juice, but I'm curious. Glad you found a copy of that Pennsylvania Dutch Cookbook; Ebay is definitely a godsend when trying to locate such things- Barnes and Noble's out-of-print book search too! What beautiful photos! This recipe sounds sublime! Glad you're taking up the meme, Shaun. I'm sure you'll have all kinds of recommendations that will be as hard to resist as Diana Henry. Grape leaves can be difficult to extricate from the jar. You will wonder how they got them in there, like a ship in a bottle. Thank you, Nora. It's hard to leave things behind, especially books; they are so much a part of us. Hi, Pel. Dolmas are also good w/ yoghurt. I don't make them often enough. They really are a nice light meal for warm weather. Thanks for the tip on B&N. I haven't looked there yet for other MIA books. I was lucky with ebay. I think the shipping cost more than the actual cookbook. Thanks, Truffle! Good to see you. Welcome, Ayseyaman! I'll bet your own recipe is wonderful. Thanks for your kind words and coming to visit. Thank you, thank you, thank you for posting on stuffed grape leaves. 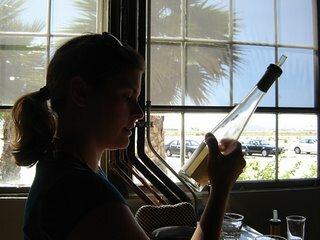 I simply adore them (in restaurants, that is)and have needed some inspiration to give them a go at home. Your vibrant photos and clear instructions are just what I needed. Thank you, Susan. These were quite tasty, and you can control the oil (and somewhat the salt) when you make them yourself. They are time consuming, but not difficult. I like to stand at the kitchen counter with a glass of wine and some Middle Eastern music in the background to make it a fun ritual. thanks Susan - I love browsing other people's shelves and so this meme appeals to me - I don't think i know any of your books but will be looking out for them! And I love your inclusion of dried apricots in the dolmades - anything with dried apricots is my sort of thing! Dolmades are one of my favourites. When recently asked what my last meal might be..... dolmades were included. Loved the inclusion of apricots with the filling!! Don't know how I missed this one Susan except my focus has been maybe off a little lately. Certainly an interesting seven books you've got here. I'll see what I can do with this one. I love dolmas and haven't had any since I quit teaching at TWU in the early 80's - I think that needs correcting! Once every couple of weeks one of us instructors would get sandwiches and dolmas from a little Greek deli and picnic in one of the lecture halls - long time ago. I FINALLY got around to doing the "7 things" meme that you tagged me for months ago. Thanks again for keeping me on my toes and for the great book recommendations here. Thanks, Johanna. It's not too late for me to officially tag you for this meme. I'll bet you have a nice collection of cookbooks yourself. Welcome, Valli! I'd choose dolmades over burgers for my last meal any time! Glad you enjoyed the apricot idea. Thanks for your kind words and visit. Tanna - I hope I've brought back some good memories for you. What's so nice about cooking is that you can fast forward those good times to the present. Only take up the meme if you are so inclined. You were an easy pick, given your vast cookbook collection. Christina - No duress intended with the meme. Thank you for taking it up at all. Glad you enjoyed the peek in my crammed bookcase. cool post. i love stuffed grape leaves and just made them for the first time after finding this recipe from Steve Zallion about his mother's recipe. Thank you, Eatwell. I'll go have a look at Steve's recipe. 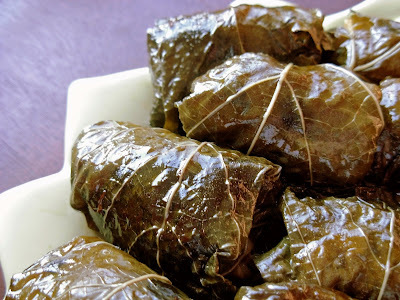 i have been making dolmas for some times now and these look wonderful... i think that is what is so fun about them.. i simple concept that everyone puts a little spin on with their choice of ingredients.... your taste seems to be similar to mine.. sweet, slaty, savory.. yumyum! Yum, found this on Tastespotting...they look delicious. 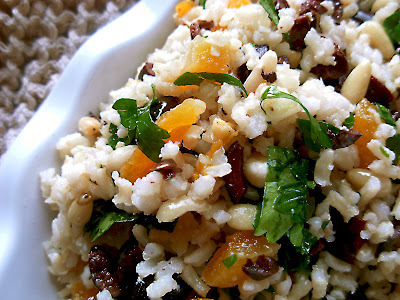 My mouth is watering thinking of the pine nut and brown rice combo in the savory grape leaves... Mmm.